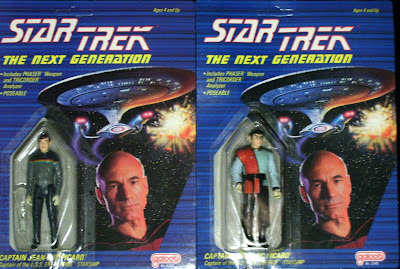 Back on December 14, 2006, in Retro Toy Flashback # 52, I looked at the Galoob line of toys and action figures from Star Trek: The Next Generation. 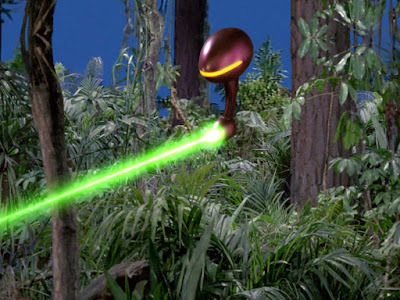 At the time of that post, there was some interest generated in the comments section of the blog for the action figures that were never actually released to the public, specifically those of Acting Ensign Wesley Crusher (Wil Wheaton) and the Romulan (seen in the first season finale, "The Neutral Zone" with a flashy new look and Warbird). A few weeks ago, a gentleman named Greg Peters contacted me with some further information on these toys. He actually owns a pair of these ultra-rare figures. Anyway, Greg was kind enough to send me the scan of his figures. (above). You can see, they are ensconced on Captain Picard cards with no original art, but still -- wow! The Galoob Holy Grail! Greg also directed me to some background data on the toy line. In Trek Collector (Summer 1993), for instance, it was written in regards to these figures that "Galoob announced additional action figures to the line including the Romulan and acting ensign Wesley Crusher, but these were never released." Toy Collector also had a piece on Galoob's Star Trek: The Next Generation toys in February 1996. An article by Jean Paul Vaudreuil featured photos of the unreleased "Enterprise starship action playset." Now, does anyone out there own one of those? Send pics!